Many celebrate each Saturday or Sunday with Ruth Ayres at Discover Play Build and the rest of the wonderful community that celebrates together. In light of the terrible events that have happened in the past month, really year, I celebrate that I have joined in on several petitions to express my wishes that it is ENOUGH. There are always good things that happen during the week. I am happy to find them, and hug them tight. Another nice day at the bookstore, one lovely time shopping for a few gifts so I can wrap and mail them, receiving some beautiful created things ordered from a crafty friend on Etsy-excited to give these handmade things. I wrote, for PiBoIdMo, and am ready to work more on several ideas. I had to stop this challenge last year because it's when I started with the class full time, so am so happy I wrote all through November from the posts. Imogene now comes to spend Wednesdays after school through dinner with me. Most of the time she plays, then we read books, and more books. This time she helped me unpack some of the Christmas people, played with them, undressed and dressed them, and left them arranged for next time. Ingrid still spends Fridays after school through dinner with me, and this time I had a surprise. She learns fast, and made her first hotpad! Do you remember doing this? And, it was extraordinarily warm again these past two days, short-sleeve weather! 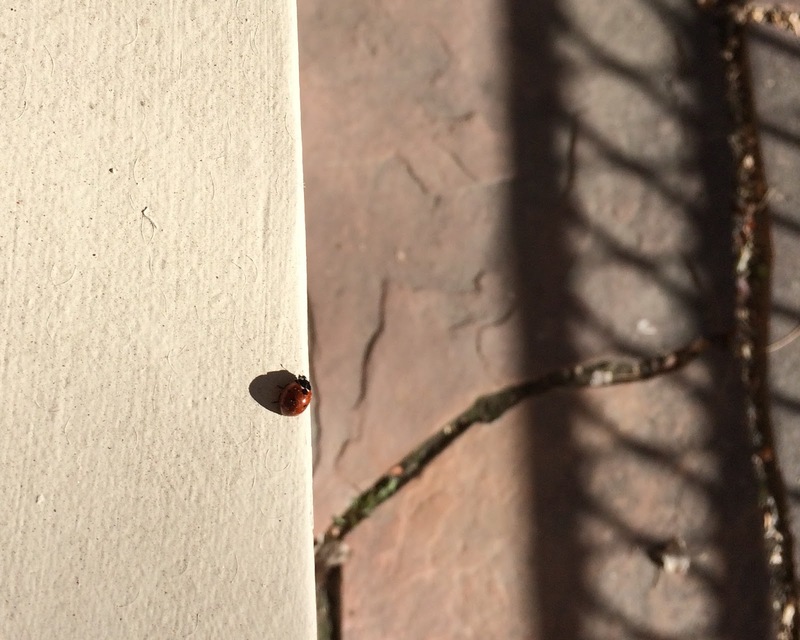 I returned from a walk, and there was a ladybug come to visit. I was so surprised that I wrote a poem for Facebook. And discovered that Ladybugs do hibernate, but wake up sometimes when it's warm. I wish you hugs today and through the week! No such thing as too many hugs. :) You & Ingrid are making some special memories! Thanks, Jane. It was such fun to do, and with my old, old loom. 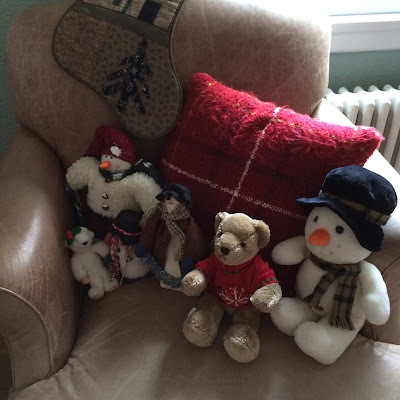 Snowmen, hugs, those grand girls, a ladybug and a poem. Wonderful celebrations! 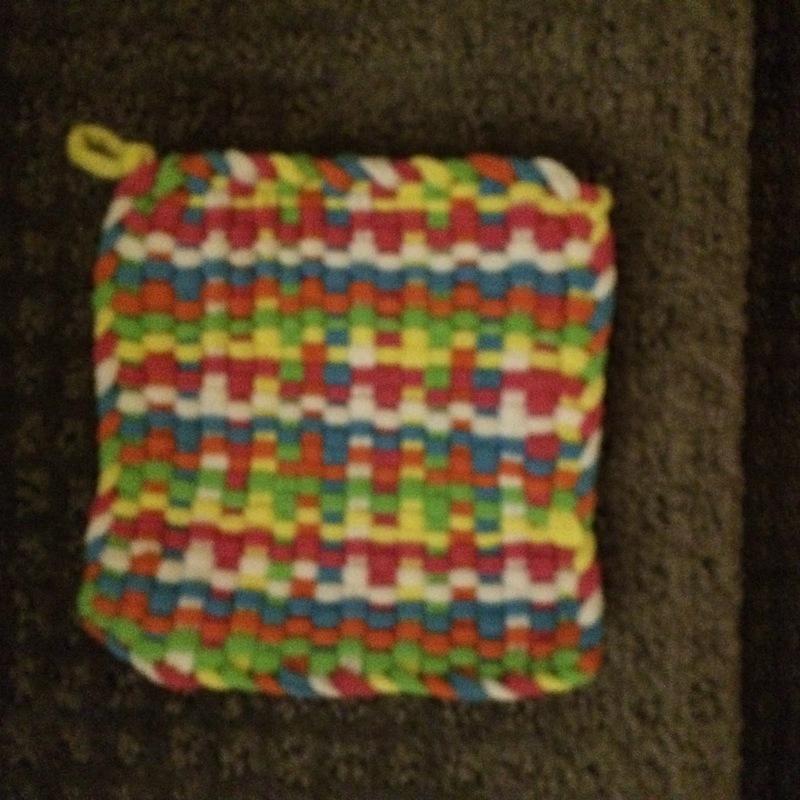 Yes, I do remember making those potholders. So much fun to see you passing it on to the next generation! Thanks, Ramona, every part of the week was fun, including the grand-girls, of course. This weekend, the tree! I am so curious as to what the ideas you have been playing with throughout November. I wonder if your grandkids and bookstore life have been of some inspiration. Oh, Terje, there are so many. Now I just need to settle upon one, & write! My grandkids & children in general are my inspiration for sure. The bookstore is fun, but will simply add to my book knowledge, whirling around in my brain, always! Thanks, Julieanne, time to consider winter and snow! I'm guessing many of us have made those hotpads. I hope finding that lady bug brings you loads of luck. I never thought of that, wow, I hope so, too! 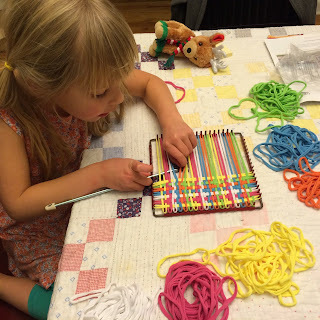 Oh, my children used to make hot pads at Christmastime for family - such fun memories! Love the picture of Ingrid, so focused on her weaving. She worked hard & I kept suggesting that we could take a break, but no, had to finish. And she understood immediately, always a question of will they. Good memories of my kids making them too. I LOVED making hot pads! Everyone I knew received one for Christmas during those years! I currently have one that my niece made me a couple of years ago. Love the ladybug poem too. It does make you wonder why it was there and where it was off to? Have a great weekend! Thanks, Leigh Anne. I still have one of the earlier hotpads, but don't remember where it came from. It was fun sharing this with Ingrid. Hope the rest of your weekend is good too! How wonderful that your granddaughters still get to spend special time with you each week. They will remember that forever! I loved making those hot pads as a kid and your picture took me back in time. I tried to teach my own children how to make those when they were younger, but they never took to it. Loved seeing Ingrid's creation! I don't know how long she'll be doing this, but it was fun Friday night, Jennifer. Thanks. I hope so, too, Holly. Love that you called it a 'rite of passage'! Ingrid is so wonderfully focussed! I love reading of the time you two spend together. Thanks, Carrie. It's fun to share, too. How did Ingrid's hot pad come out so nice and even? I remember them well. I love that a ladybug visited you. Wasn't it just last weekend you were posting snow pictures? We are finally getting a cold snap, just in time to get my Christmas tree. I hate getting a tree when it's warm. Have a happy week! I thought all the hotbeds came out like that, didn't they? Just happened! Yes, last week was very cold with snow, now this week will be in the fifties and sixties. I keep having to change out the wardrobe! Thanks, Margaret. Enjoy your tree. Mine is up, but no decorations! Hotpads-a shot from the past. I am glad that you have a little friend who is learning the art. Linda, your poem is delightful. Maybe it will be included at the end of the gallery. Let's see. Thanks, Carol, will look forward to all those autumn celebrations. I totally remember making hotpads! What fun. Your ladybug encounter and poem are so sweet. Thanks, Crystal, both special things this week. Glad you remember those special creations, too.